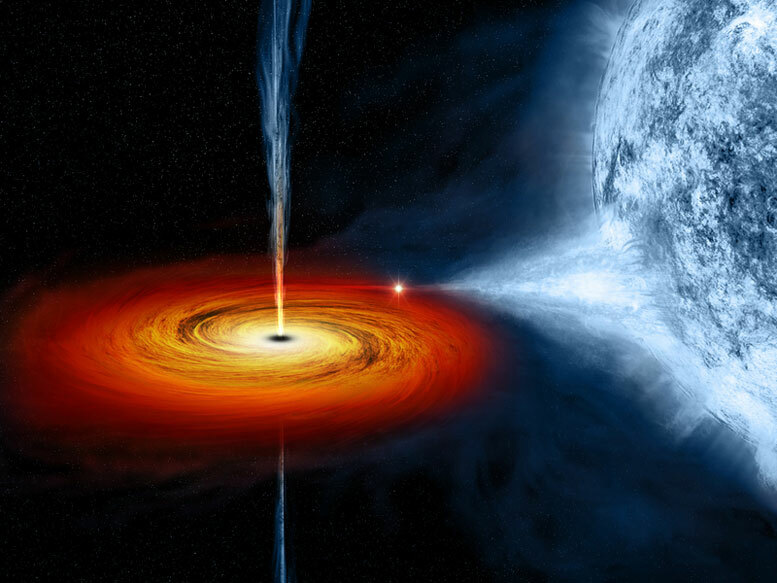 Black holes don't just sit there munching away constantly on the space around them. Eventually they run out of nearby matter and go quiet, laying in wait until a stray bit of gas passes by. Then a black hole devours again, belching out a giant jet of particles. And now scientists have captured one doing so not once, but twice - the first time this has been observed. The two burps, occurring within the span of 100,000 years, confirm that supermassive black holes go through cycles of hibernation and activity. 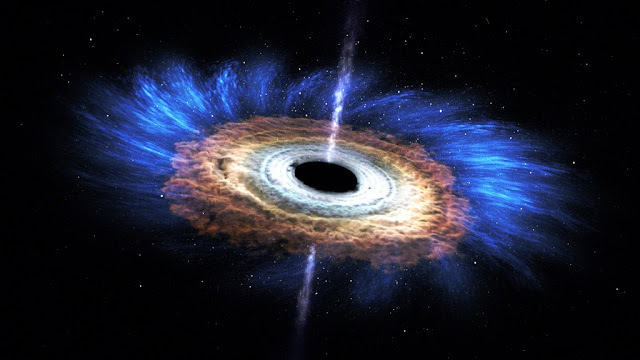 It's actually not as animalistic as all that, since black holes aren't living or sentient, but it's a decent-enough metaphor for the way black holes devour material, drawing it in with their tremendous gravity. But even though we're used to think how nothing ever comes back out of a black hole, the curious thing is that they don't retain everything they capture. When they consume matter such as gas or stars, they also generate a powerful outflow of high-energy particles from close to the event horizon, but not beyond the point of no return. The black hole which is in question here is the supermassive beast at the centre of a galaxy called SDSS J1354+1327 or just J1354 for short. It's about 800 light-years from Earth, and it showed up in Chandra data as a very bright point of X-ray emission - bright enough to be millions or even billions of times more massive than our Sun. The southern bubble had expanded 30,000 light-years from the galactic centre, while the northern bubble had expanded just 3,000 light-years from the galactic centre. These are known as Fermi bubbles, and they are usually seen after a black hole feeding event. From the movement speed of these bubbles, the team was able to work out they occurred roughly 100,000 years apart. So what's the black hole eating that's giving it such epic indigestion? Another galaxy. A companion galaxy is connected to J1354 by streams of stars and gas, due to a collision between the two. It is clumps of material from this second galaxy that swirled towards the black hole and got eaten up. "This galaxy really caught us off guard," said doctoral student Rebecca Nevin. 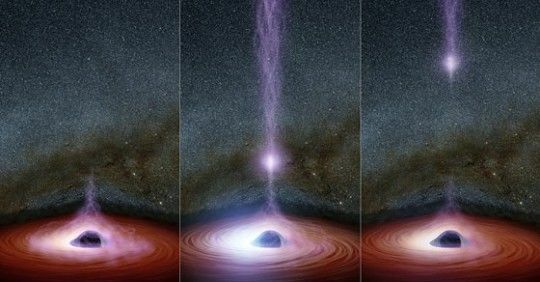 "We were able to show that the gas from the northern part of the galaxy was consistent with an advancing edge of a shock wave, and the gas from the south was consistent with an older outflow from the black hole." This article was initially published on Sciencealert. You can read the article here. "The black hole which is in question here is the supermassive beast at the centre of a galaxy called SDSS J1354+1327 or just J1354 for short. 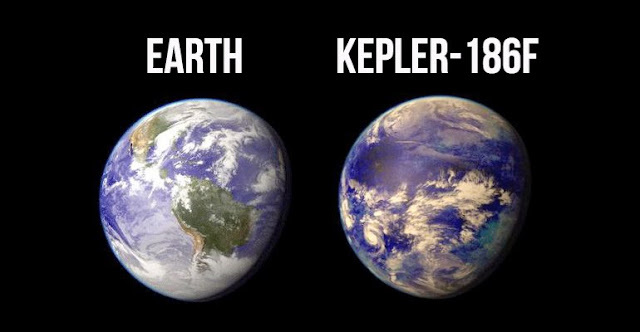 It's about 800 light-years from Earth"
ummmm... Do you want to revise that statement?? The super-massive black hole at the center of galaxy SDSS J1354+1327 is 800 light years away?? Closer than the Andromeda galaxy at 1000000 light years? Inside our own galaxy?? Not your mistake, I know, but there's no way to comment at the source. Maybe you can pass it on?